On the happy occasion of Gandhi Jayanti, let's remember the team of men who made India. The triumvirate of MK Gandhi, Sardar Patel and Pandit Nehru was the architect of independent India. At a time when the right wing in India wants to appropriate Patel - the Iron Man as a symbol of their vision of a 'strong' India, when Nehru's legacy is in tatters because of ossified dynastic politics, and Gandhi remains relevant largely because of his mug on INR notes, it'd be good to remember that as a people we are capable of rewriting our own future, provided we work together as a team, despite our differences. While Nehru was popular with the masses and could engage with the world polity, Patel had the craft and cunning to meld the princely states into a newly partitioned India. 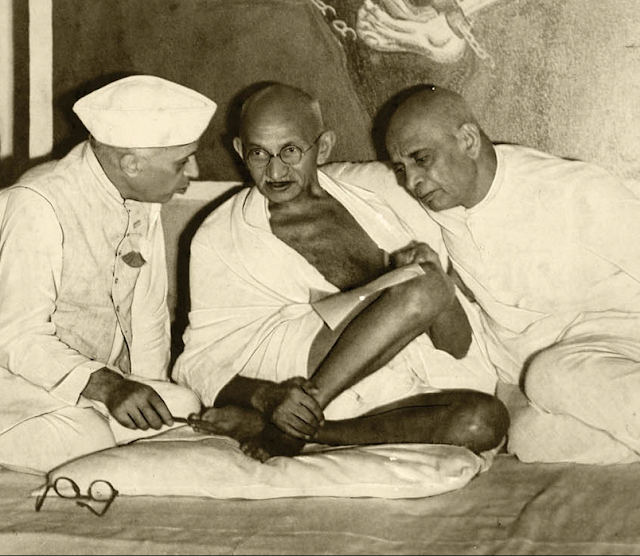 In Patel's words to Nehru: "We have both been lifelong comrades in a common cause. The paramount interest of our country and our mutual love and regard, transcending such differences of outlook and temperament as existed, have held us together." Pay heed, for beyond NaMo and RaGa, lies India. "Pay heed, for beyond NaMo and RaGa, lies India." -- Well said!